If you’re looking for an easy, portable option for outdoor cooking, a hibachi grill could be the answer. Here, we take a look at the best cast iron hibachi grills available today. And we’ll tell you what features to look out for to make the perfect choice. Do you want to vary the cooking temperature? Where will you be cooking? Who doesn’t love cooking in the great outdoors? 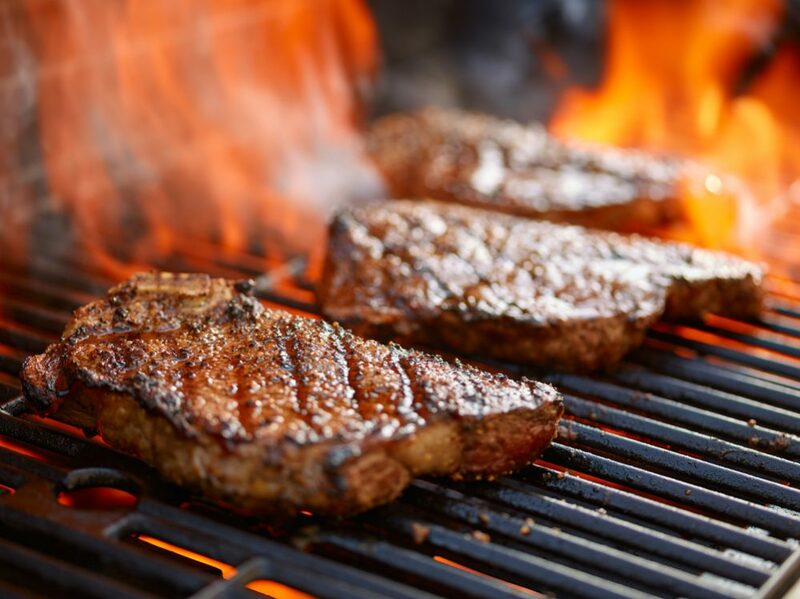 When all that fresh air has given you an appetite, there’s nothing better than the smoky flavor of grilled food. And if you’ve got loads of people over for a party, a full-sized grill is perfect. You can load it up with plenty of burgers and sausages, and keep cooking for hours. But it’s often just the two of us at home. We found firing up a standard barbie wasted time and charcoal. Waiting for it to heat up, then watching the coals continue burning after we’d finished cooking was a frustrating business. So when we saw a friend’s hibachi grill, we knew we had to have one! It was compact enough to work effectively with small amounts of charcoal and heated up quickly. No more waiting around for an hour before we could get on with the cooking! Even better, we realized it was portable enough to use away from home too. We pictured heading out for the day, hibachi in the car boot, stopping at a quiet beauty spot to grill some steaks… It sounded like heaven. So we headed out to buy a hibachi grill. To our surprise, they proved rather difficult to find. Our local hardware store only offered lightweight single-use barbecues – basically an aluminum foil carton with mesh on top. We were after something made of cast iron that we could use time and time again. So we turned to the internet. And that’s when things got complicated. Many of the grills we found looked completely different to each other. Confused, we spent ages working through the features and reading reviews from seasoned hibachi grillers. But when we finally bought our grill – we loved it! If you’re as confused as we were, you’ve come to the right place. Read on for our list of the best cast iron hibachi grills out there today. This hibachi-style grill from Lodge has lots to recommend it. Its shape has more in common with a standard barbecue than the pot of a traditional hibachi. It’s pill-shaped rather than round, but its tapered legs and squat form still carry a hint of more traditional models. Made from cast iron, it has the gently pitted surface you’d expect. That gives it a lovely rustic quality, and with care, it can last for years. Lodge has been making cast iron cookware since 1896, so they know a thing or two about what they’re doing. The grill comes pre-seasoned, so you won’t need to worry about rubbing in oil before the first use. The seasoning is done with pure vegetable oil, so there’s no risk of chemicals getting into your food. And as with all cast iron appliances, the more you use the hibachi, the better it will get. Keep it oiled, and it will also get easier to clean every time. Lodge call their products “heirlooms”, which tells you everything you need to know about their durability. The grill surface here is more generous than many hibachis. It’s possible to fit on four rib-eye steaks or a couple of whole fish. Just beware if you’re cooking sausages – there’s no rim around the grill to hold them in place. Watch out for them rolling away if they’re not positioned carefully! The coals are accessible behind a flip-down door. There’s also a removable draft door that can be opened or closed while you’re cooking to regulate the heat. That gives you the option of keeping food and drinks warm at cooler temperatures. The two cooking heights are produced with a simple design – the cooking grate stands on short legs. Using the legs will give it extra height above the coals, cooking your food more slowly. Alternatively, turn the grate upside down to get the surface closer to the coals. The compact nature of this grill means you won’t have to use much charcoal to get it going. And the cast iron construction is brilliant at keeping in the heat. All this makes the Lodge Sportsman’s Grill a fuel-efficient choice for outdoor cooking. Bruntmor’s hibachi-style grill has a number of similarities to the Lodge version, and it looks very like it too. There are the same pill-shaped construction and attractive black cast iron finish. The legs on the cooking grate stand slightly taller than on the Lodge. That means that if you use the grate in its upright position the food will be slightly further away from the coals. Upside down, and there’s no difference between the two. Another minor difference between the models is the carrying handle. Both are made of stainless steel, but while the Lodge version is plain, Bruntmor’s has a thicker section in the center. It’s a neat touch that makes it a little more comfortable to carry. And with the whole grill weighing in at around 30 pounds, it’s easy to take it on your travels. This is another grill that’s pre-seasoned, so you can cook on it straight away. Keeping it oiled after every use will prolong its life, as well as making it easier to clean. The cooking grate is a generous 17 inches wide by 9 inches deep. That’s enough for those four large steaks. As with the Lodge grill, the surface is entirely flat – so watch out for corn making a bid for freedom! There’s a door at the front which you open up to add the coals. You can also keep it open when cooking to allow in more air and moderate the temperature. There’s a smaller sliding door too, for ventilation. So far this may all be sounding nigh on identical to the Lodge Sportsman Grill. There is, though, one big difference: the price. Bruntmor’s version costs half as much as Lodge’s at full price. To be fair, some retailers offer a good discount on the Lodge grill, but you’ll still find yourself paying more. So what lies behind the difference? Well, the Lodge grill is made in the USA, while Bruntmor’s is made in China, where manufacturing costs are lower. If you’re American and want to support domestic producers, you may be prepared to pay more. And we think the Lodge offers more reliable quality. But if you’re looking for an economical option, the Bruntmor grill is well worth considering. Another step away from a traditional hibachi in design, the Marsh Allen grill nevertheless has lots of great features. The cooking grate here is actually two grates which sit alongside one another. Both have wooden handles which stay cool so that you can move them easily as you cook. The two grate design means each grate is lighter and gives you a little more flexibility. The grates can be positioned at three levels above the coals. That means you can cook food on one grate at the bottom and keep ready-cooked food warm at the top. It works brilliantly to keep a foil-wrapped jacket potato warm while you’re cooking a steak, for example. And if you want one burger rare and another well-done, you can use the same cooking time on different levels. There’s also an adjustable air vent beneath each cooking grate. Open or close it to admit more or less oxygen and moderate the cooking temperature. There’s no door to the fire chamber. The coals simply sit in the bottom, with a grille over the top. And because it’s made of cast iron, it will reach and maintain a nice high temperature fast. The cooking surface here is 157 square inches. We’ve found it’s plenty big enough for three steaks or chicken breasts, plus a few heads of asparagus. Another nice feature is the gentle curve to the side edges of the cooking grates. Position your sausages or corn parallel to those, and you won’t have to worry about them rolling off. Instead of a single stainless steel handle, this grill has a fixed handle on either side. The central handle sections are again made of wood, so it’s easy to move even during cooking. One thing to note, though, is that this grill isn’t pre-seasoned. You’ll need to rub in some cooking oil – vegetable or olive oil work well – before the first use. Rub it over again when you’ve finished with it, and the cast iron will be protected from rust. That’s a minor issue, though, for a grill that’s very competitively priced. If you’re looking for a hibachi offering plenty of flexibility in cooking temperatures, it’s a great choice. If you’re looking for a traditional hibachi grill, this version from Update International should make your shortlist. With its classic cone shape and wooden base, its Japanese heritage is evident in every line. It’s as much an interesting talking point as a useful cooking appliance. But of course, you need it to cook well too – so how does it measure up? Well, it’s a small grill, measuring just 4 inches tall and 31/3 inches in diameter. That means it’s better suited to toasting marshmallows or s’mores than cooking a full meal. It also works well as the centerpiece to a platter – like the pu pu platters in Chinese restaurants in the USA. You can use it with charcoal, but you’ll only be able to fit a couple of lumps inside. A better alternative is a cooking gel-like sterno, which also gives you the option of cooking indoors. The cooking grate is dead flat. If you want to balance food on the small surface, do it carefully so it doesn’t roll off. The holes in the grate are also relatively small – though a plus point is that the design looks authentically Japanese. The cooking chamber sits on an elegant wooden base. It looks very stylish, but if you want to use it without the base you can. It’s secured at the bottom with a single screw, and the pot will stand up perfectly well without it. The wooden base itself is sized to fit neatly into the center of a 12 or 14-inch pu pu platter. So if that’s what you have in mind, it will look great. This may be much smaller than other hibachis on our list, but it’s much cheaper too. You could buy four of them for about the same price as the Bruntmor grill. Why not do that very thing, and invite your guests to cook their own food together? It’s great fun and brings a real sense of occasion to dining. As with all cast iron appliances, make sure you oil it after use. This will prevent the air getting to the surface and causing it to rust. Overall, then, this isn’t the best grill for a full meal. But for toasted snacks at a bonfire night party, it’s just the ticket. Despite its name, the Cajun Classic is another hibachi that looks distinctly Japanese. 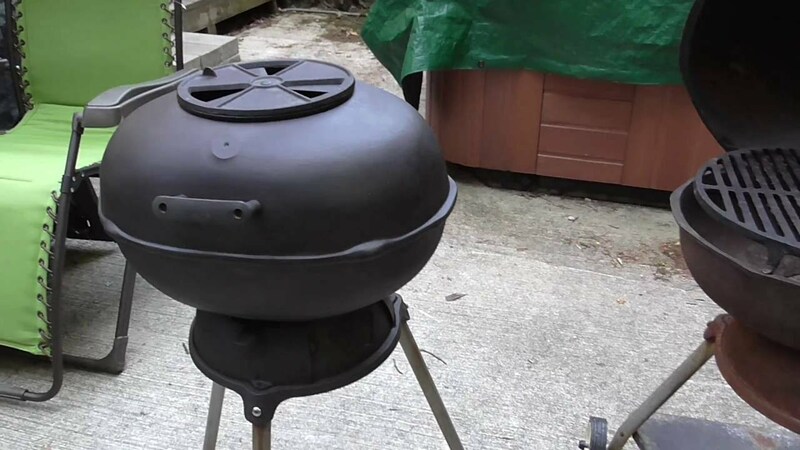 It’s a cross between the traditional pot shaped hibachi and a standard grill. It’s squatter than a pot, but has a round cooking grate rather than the rectangular form of standard grills. The cooking surface here is more generous than most of the other hibachis on this list, with a diameter of 15 inches. That’s big enough to comfortably fit nine four inch burgers. There’s a useful handle to lift up the grate. We’d prefer it to be a bit longer to get more leverage, but it does the job. The downside of the more generous proportions of this grill is that it’s fairly heavy. It weighs in at 40 pounds, a third as much again as the Bruntmor. There’s a stainless steel handle, though, so you can carry it if your muscles are up to the job. There’s a drop-down door to add the coals and scoop out the ashes. There’s also a ventilation door at the bottom that can be slid across to let in air. Both allow you to fine-tune the cooking temperature. As with the Lodge and Bruntmor, there are two options in terms of cooking height over the coals. The Cajun Classic works the same way as both of them. The cooking grate stands on short legs, so turn it upside down to get the surface closer to the coals. It will still fit neatly in position. This is another grill that’s seasoned at the factory, so you can cook on it straight away. You’ll want to give it another oil after every use to keep the cast iron in good condition. If your grate does give out, though, it’s possible to buy a replacement. That gives you a great option to keep using this hibachi for years. This is another mini hibachi in the same vein as the option from Update International. It looks just like it too. There are the same pot shape and the same wooden plinth. Even the grate has the same distinctive Japanese-inspired pattern in its grid. This one is a little more expensive – but you’ll still get two for the price of a standardly sized hibachi. It’s just over 5 inches tall when standing on its plinth, with a diameter of a little over 3 inches. It’s possible to fit in a lump or two of charcoal, but we prefer to use a cooking gel-like sterno. Buy the smallest can possible, or simply spoon it into the fire chamber. This is another grill that’s best for small snacks like toasted marshmallows or s’mores. If you’ve got children, it’s a fun way to introduce them to grilling – with close supervision, of course. And as with Update International’s hibachi, this will work just as well inside as out. Place it in the center of a platter of appetizers for a real wow factor at the table. Or buy more than one and let your guests get involved in the cooking. It’s possible to place food directly on the grill to cook, but bear in mind that it’s small. You’re best sticking with flat foods like burgers so they’ll sit on there securely. It won’t get as hot as a standard grill either. So if you do want to use it to cook meat, go for thin cuts. Give them plenty of time, and check they’re cooked through before serving. This is an ultra-simple hibachi in the tradition of the original Japanese grills. There are no air vents to regulate the temperature or other gadgets. You can, though, get two different cooking heights by turning the grate upside down. It’s made of cast iron, so it will need a little care to keep it in good shape. But with a grill, this small, regular oiling won’t be too much of a chore. Keeping it wrapped in kitchen paper or baking parchment between outings will also help it stay in good condition. This grill from Town Food Service is the most expensive of the three mini hibachis to make our list. It still costs less than a cheap, standard hibachi – but not by very much. So is it worth considering? We think it is. There are some subtle design differences here that merit a closer look. The most obvious is the plinth. Unlike the hibachis from Chef-Master and Update International, this one is made of cast iron, not wood. The fire chamber doesn’t sit immediately on top of it, but stands proud on three short legs. That means there’s less heat transfer to the plinth, and in turn more protection for your tabletop. It does mean it’s heavier, but the difference is small. The whole thing still weighs less than three pounds. The cooking surface is about the same size as the other mini hibachis. The same issues apply here too. It’s completely flat, so take care that sausages or corn don’t roll off. And it’s small, so a better option for snacks than main meals. The grate has the same design as the other mini hibachis, looking just as Japanese as you’d imagine. Then there’s the option to change the cooking height by turning it upside down. One minor difference though, is the width of the holes in the grate. In this grill, they’re narrower and closer together. If you do want to sear meat on the top, you’ll get a few more charred lines as a result. For us, that’s one of the joys of cooking on cast iron, so it’s a nice bonus. You still won’t fit in more than a couple of lumps of charcoal, though. Most people using this will opt for cooking gel instead. It’s fun to have the option of using it inside, but we still prefer the smoky flavor charcoal provides. This is another hibachi that’s simplicity itself. There are no vents or drawers, and not even a tool to remove the grate. We think that’s part of its charm. Cooking on this really does respect the cultural traditions of the Japanese hibachi. Still wondering which of these is the best cast iron hibachi grill for you? Here are some things to think about before you make your final selection. To start with, think about how many people you’ll be cooking for. Most hibachis will handle about four steaks or burgers at the same time. If you want to fit on extras – asparagus spears or slices of pepper, perhaps – go for a bigger grate. The Cajun Classic, with its 15 inch circular grate, is the biggest we’ve found. If, however, you’re looking for something to toast some marshmallows or cook a few kebabs, consider a mini hibachi. These are really simple to use and heat up fast, but they won’t get as hot as a standard grill. That brings us to the next thing to consider: what kinds of food you’ll be cooking. Vegetables can cope with lower temperatures and won’t take long to cook. 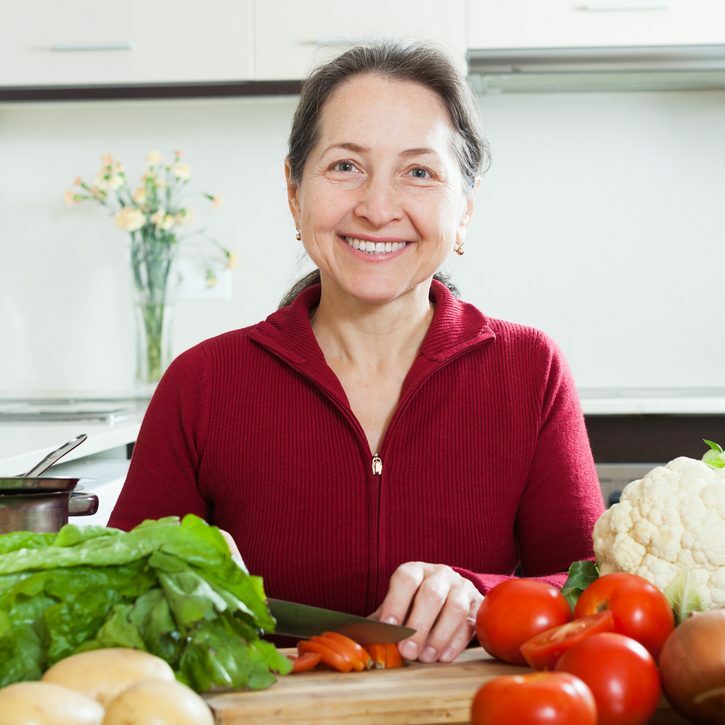 But if you want to cook meat or fish – particularly thicker cuts – you’ll need real heat. Go for a standard hibachi like the Lodge or Bruntmor. Next, consider the shape of your food – that’s right, the shape! Will you be cooking steaks or chicken breasts that would line up neatly on an elongated grate? Or would a circular grill suit your irregular shaped vegetables better? And beware foods that roll! Most hibachis have a completely flat surface. That means it’s all too easy to lose a sausage or corn cob. Marsh Allen have dealt with this by giving two sides of their cooking grates a gentle curve. If you love a hot dog, you’ll find it’s a handy feature. Think about whether you want to be able to cook at different temperatures. All charcoal fueled hibachis will allow this to some extent, because the temperature will change as the charcoal heats up. But if you want more flexibility, look for options where you can change the height of the grate. Most hibachis have cooking grates that stand on legs. That means a simple way to bring the coals closer is to turn them upside down. That will help you continue cooking even as the charcoal is losing heat. Don’t assume, though, that all grates with legs will work in this way. Check before you buy that the grate will sit inside the frame of the hibachi when it’s upside down. Others will have grate holders at different heights. That makes it easier to bring food closer to the coals or move it further away. And some hibachis will allow you to cook at different levels at the same time. It’s a great option if you want to cook meat and vegetables together without needing to get your timings perfect. And it also gives you the option of keeping food warm whilst you cook other things. Marsh Allen’s hibachi features two cooking grates side by side. That means that food on one grate can be exposed to higher temperatures than food on the other. One of the great things about hibachi grills is that they’re smaller than standard versions. That means they’re more portable. But not every hibachi will be as easy to move from A to B like any other. Cast iron is heavy, so check the weight. Mini hibachis will be considerably lighter – expect them all to weigh less than three pounds. A standard hibachi can weigh 40 pounds, but others are far lighter. The Bruntmor, for example, weighs in at 30 pounds. And take a close look at the design of the handles. Will they stay cool during cooking? Will they be comfortable to hold, or cut into your hand as you carry the grill? And are they robust enough to take the weight? Of course, if your priority is simply a smaller grill, portability will be less important. If you don’t plan to take it out and about, you may want the resilience of a heavier grill like the Lodge. The major benefit of a hibachi made from cast iron is its ability to sear food. The flat metal surface will give you that distinctive charred pattern on meat and even vegetables. The downside, though, is that, despite its weight, cast iron isn’t the most durable material. That’s because it rusts. Protecting your grill from corrosion is essential if you want to be able to use it beyond a single season. That means oiling it carefully after every use. You can use any kind of cooking oil to do this, but something with a low smoke point, like vegetable or canola oil, is best. Just make sure you cover the whole surface. The bigger your grill – and the more nooks and crannies it has – the longer this will take. A simple mini hibachi like the one from Update International can be done in just a few minutes. But a larger grill like the Cajun Classic will be a different proposition. And any vents or coal drawers will add on extra time too. Be honest with yourself about whether you’re prepared to do this. Cleaning off the rust is hard work and will degrade your cooking surface. A smaller hibachi is well worth considering if you won’t have the time or patience to maintain a larger grill. Any cast iron cooking appliance needs to be seasoned before it’s used. That simply means rubbing in oil to create a protective surface. It’s exactly the same process as you’ll need to follow to maintain it in good condition. If you’re keen to use your lovely new hibachi straight out of the box, though, that is possible with some models. A number of manufacturers pre-season their grills at the factory. That means they’re ready to go as soon as you get home. If you’re planning a lazy day in the garden, that will be an appealing option. One other factor to consider if you want to start cooking quickly is the size of the grill. The smaller dimensions of hibachis mean they’re quicker to get going than standard grills – but they still vary. The fastest option is a mini hibachi. Just add a few tablespoons of cooking gel and you can be ready to go in seconds. If you prefer charcoal, you won’t fit in more than a couple of lumps – so again, it will be ready fast. Bigger grills, like the Lodge or Cajun Classic, will take a little more time. On the plus side, they’ll keep going for far longer. If you have more to cook, you won’t have to spend any time removing the grate and refueling. That brings us to the end of our list of the best cast iron hibachi grills on the market. We hope you’ve enjoyed it. And more importantly, we hope it’s given you the information you need to choose your hibachi. Our favorite is the Sportsman Grill from Lodge. Its cast iron is second to none in quality, and its good looks are complemented by a generous cooking surface. You’ll pay a little more than for other hibachis, but we think it’s worth it. Whether you choose a traditional hibachi or a contemporary option, it’s a fast, fuel-efficient way to cook. So pick the style that works for you – and happy grilling!